Microscope No. 131 is a compound microscope made by Claude Simeon Passemant (17021769). 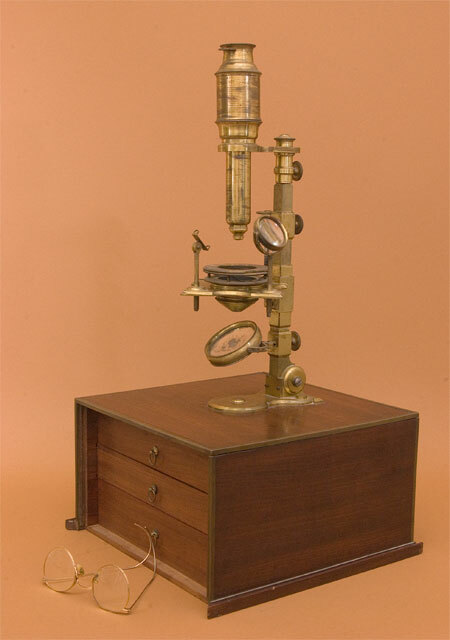 It is a Cuff-style microscope mounted on a large mahogany case with brass edgings. The case has three drawers hidden behind a downward sliding panel. The drawers contain extra objectives and an assortment of accessories. The microscope is supported by a square pillar that is hinged at the base for horizontal use. Focus is by a Hevelius screw mechanism that slides the stage up or down the support pillar. The body tube has the typical Cuff-type optics with single, biconvex objective, field, and eye lenses, and a single two-sided mirror for transmitted light illumination. The large and easily accessible cruciform stage is patterned after Cuff. A fish-plate, bull's eye lens, and stage forceps (missing) can be attached to the stage. This instrument has three sample holders: a Bonanni spring plate, a circular black/white disc, and a phial holder. Accessories include ivory specimen slides, a glass depression slide, and two brass screen holders of an unknown function. In addition the instrument has a Lieberkuhn reflector and blackened side shade that may be employed for epi-illumination. Engraved on base plate on its circumference is: "Passemant Ingenieur du Roi au Louvre". The microscope plus base is approximately 58cm tall. The base is 26cm (w) x 26(d) x 14.5 (t). Imaging through this instrument is poor. Contrast is low (due undoubtedly to poor lighting), and it exhibits a severe field lens aberration. Claude Simeon Passemant (1702-1769) knew he wanted to be an instrument maker at an early age, but it took a while before he could work at his chosen profession. First he tried to qualify as a lawyer, but failed, so he became a haberdasher. He married, then turned the business over to his wife and devoted his time to the study of optics and scientific instrumentation. He published several papers on optics and precision mechanics, constructed a variety of instruments, including an astronomical clock which he presented to Louis XIV in 1749. He then was given the title of official instrument-maker to the King, a pension, and space to live in the Louvre in Paris. Although he became very prominent among scientists of the time and claimed fanciful magnifying powers for his microscopes, his fame was due more to the quality of his workmanship rather than any special technical improvements in his instruments. This instrument in the Golub Collection attests to this quality. 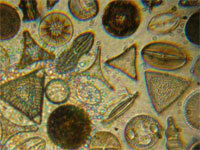 This microscope was instrument No. 54 of the original Nachet Collection of Paris.